Fundación Jocotoco maintains excellent relations with the communities that are around its reserve system, which support the conservation work of the organization. As part of its institutional policies, Jocotoco provides employment opportunities to people from local communities. Jocotoco Foundation also has a successful relationship with National and Local authorities. The municipalities and sectional governments represent great allies for conservation work. In the same way, Jocotoco works actively in awareness campaigns in the surrounding communities, aimed at adults, youth and children. It is worth mentioning that the organization was the pioneer in carrying out the awareness campaign to avoid the indiscriminate felling of Palma de Ramos and to avoid the loss of the Pericos home in 2004, which, in the beginning, focused on the provinces of the South of the country. At present, this campaign is carried out annually throughout the country and is managed by national authorities. The Orces Parakeet (Pyrrhura orcesi), discovered in 1980 by members of Fundación de Conservación Jocotoco and described in 1988, is an endemic endangered bird in Ecuador. It is found only in the Andes of the provinces of Cañar, Azuay and El Oro. Due to the accelerated loss of habitat suffered by this bird since the last century due to the expansion of the agricultural frontier, there is only 5% forest cover remaining, for this reason the populations of the species have been reduced to less than 1000 individuals, which is why it is considered as endangered by the IUCN. The Buenaventura Reserve, the only protected area in the region, protects a population of about 240 individuals, which are monitored annually since 2002. Both inside and around the Buenaventura Reserve, Jocotoco has established a system of artificial nests that have increased the population of the reserve by 30% in the last six years. 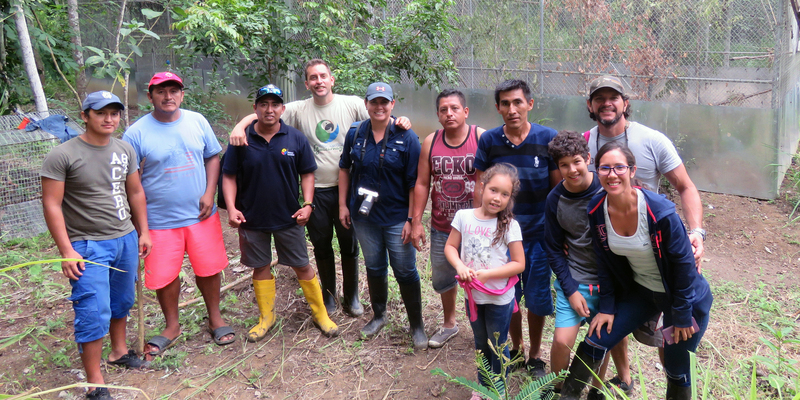 Currently, the foundation aims to extend this program in private areas located around the reserve and promote the establishment of an ecological corridor that connects Buenaventura with the Cerro Azul area, 90 km away. 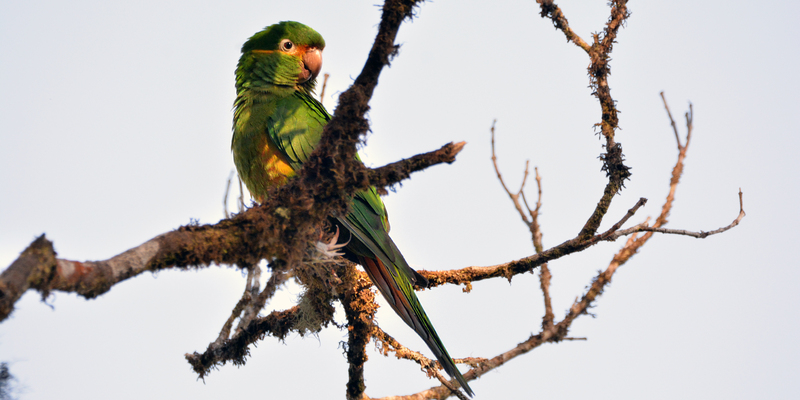 This project seeks to increase the connectivity between patches of forest existing in the area, in order to allow greater genetic exchange between the parrots, as well as to increase the altitudinal range of available habitat, which will allow several species to face climate change challenges. 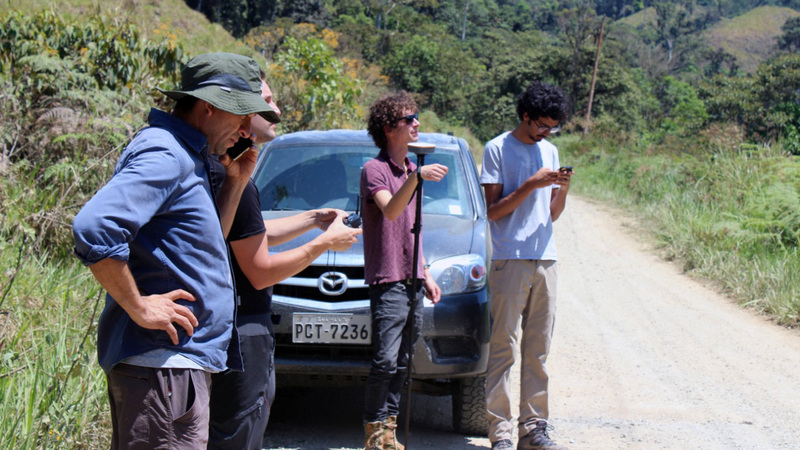 The Ecological Corridor project has the support of several institutions, such as the Provincial government of El Oro, the Municipality of Piñas, the National Institute of Biodiversity and the University of Freiburg, Germany. Kramer, J., Klauke, N, Bauer M. & H. Martin Schaefer (2016) No evidence for enforced alloparental care in a cooperatively breeding parrot. Ethology 122: 389-398. Klauke, N., Segelbacher, G. & H. M. Schaefer (2013): Reproductive success depends on the quality of helpers and on female experience in the endangered, cooperative The Gold Parakeet (Pyrrhura orcesi). Molecular Ecology 22: 2011-2027. Lucas, M. N. Klauke, H. M. Schaefer, M. Heinrich & G. Segelbacher (2010): Isolation of eleven microsatellite loci in the Gold Parakeet (Pyrrhura orcesi). Molecular Ecology Resources 10: 751-754. The Golden-plumed parakeet (Leptosittaca branickii) is a native species of the Cloud Forests of Colombia, Ecuador and Peru. This bird is classified as vulnerable by IUCN (International Union for the Conservation of Nature). This species lives in areas of cloud forest and nests mainly in dead wax palm logs (Ceroxylon parvifrons). In Ecuador, this species is distributed in isolated groups located in the Andes of the south and north of the country. The main threat facing this species is the fragmentation of its habitat and shortage of natural nesting cavities due to the cutting of wax palms for the traditional celebration of Holy Week, which has caused a rapid and continuous decline in population figures in the last decades. Little is known about the ecology and natural history of this endangered species and restricted distribution in the country. 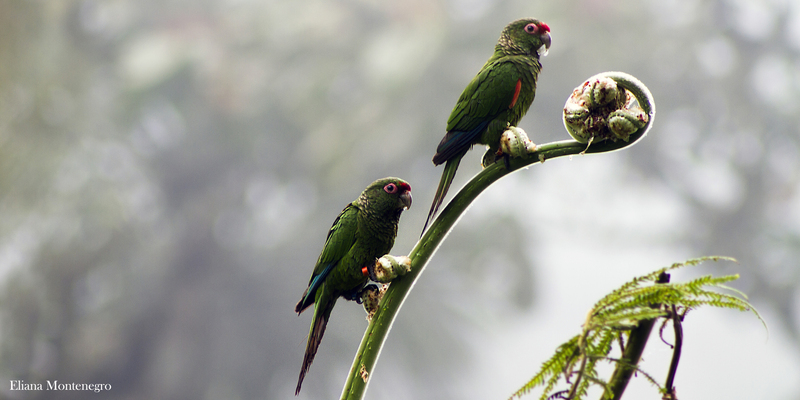 The Tapichalaca Reserve protects 3000 hectares of cloud forest and hosts the largest accessible population in the world of Golden-plumed parakeets. Since 2005, Fundación de Conservación Jocotoco, with the support of local governments, has developed a campaign that aims to reduce unsustainable exploitation of wax palm. Similarly, since 2008, Jocotoco installed 18 nest boxes in the Reserve to compensate for the shortage of nesting cavities available for this species. These nest boxes have been successfully occupied by Golden-plumed parakeets during their breeding season, as well as by other species of parrots such as the White-breasted parakeet (Pyrrhura albipectus). 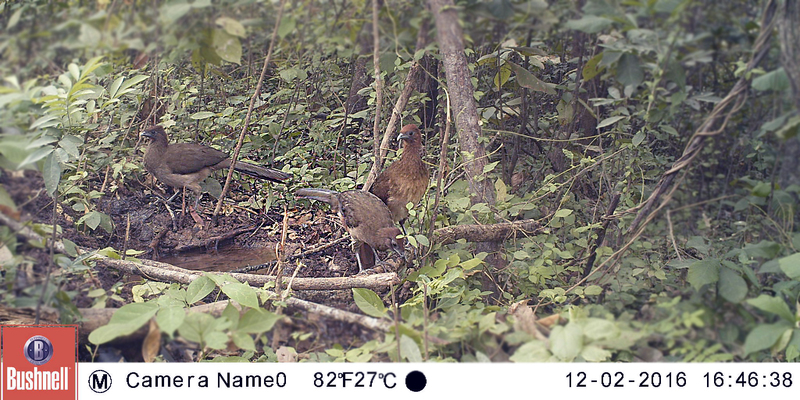 During 2015, monitoring of artificial nests in the Tapichalaca reserve during the breeding season was carried out. A total of 15 nest boxes were occupied, resulting in 22 chicks. At present, 30 additional nest boxes were installed in the reserve and in nearby areas. The foundation conducts annual monitoring of the nests during the breeding season to record the reproductive success of the species. The Pale-headed Brushfinch (Atlapetes pallidiceps), endangered and endemic species of Ecuador, has a world population of approximately 250 individuals, which are found only in the Yunguilla Reserve, property of Fundación de Conservación Jocotoco. This brushfinch was re-discovered in the year 1999 in the Yungilla Reserve, with a population of 30 pairs (previously categorized as Critically Endangered). After several years of work and research on the conservation of this species, in 2009 it was possible to obtain a population increase of 100 couples, getting them to be in the category of Endangered for the year 2011. The main threats that the species faces are the parasitism of their nests by another species of bird, the Shiny Cowbird (Molothrus bonariensis), which reduces its reproductive success, and the risk of fire affecting its habitat. As a result of Jocotoco's intense conservation efforts, the Pale-headed Brushfinch is one of the few species worldwide that has recovered from being critically endangered. 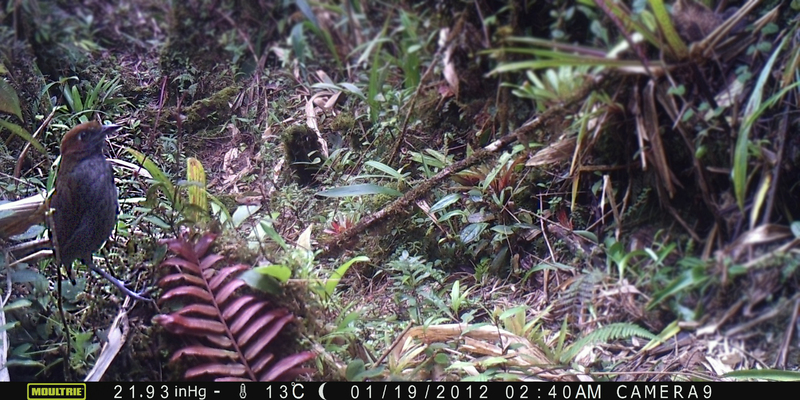 Jocotoco Foundation continuously performs studies on the Pale-headed Brushfinch. One of the most recent studies analyzed the decrease in genetic variability in the population of this species, which is found in the Yunguilla reserve. Hartmann, S., Segelbacher, G., Juiña, M. E. & H. M. Schaefer (2015): Effects of habitat management can vary during the recovery of an endangered bird species. Biological Conservation: 192: 154-160. Hartmann, S., Schaefer H. M. & G. Segelbacher: Genetic depletion at adaptive but not neutral loci in an endangered bird species. Molecular Ecology 23: 5712-5725. Hartmann, S., Schaefer H. M. & G. Segelbacher (2014): Development of 12 microsatellite loci for the endangered Pale-headed Brushfinch (Atlapetes pallidiceps) and their cross-amplification in two co-occurring Brushfinches. J. Ornithol. 155: 835-839. 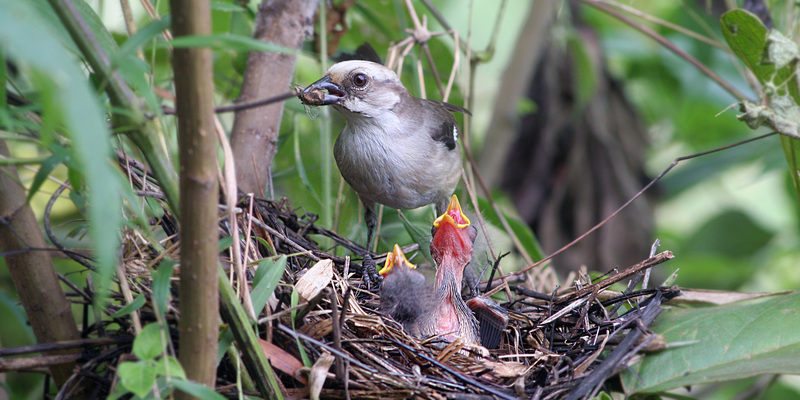 Krabbe N, Juina M, Sornoza AF (2011): Marked population increase in Pale-headed Brush-finch Atlapetes pallidiceps in response to cowbird control. J. Ornithol. 152, 219-222. Oppel, S., H. M. Schaefer, V. Schmidt, & B. Schröder (2004): Habitat selection of the Pale-headed Brushfinch, Atlapetes pallidiceps, the role of interspecific competition, and implications for management. Biological Conservation 118: 33-40. Oppel, S., H. M. Schaefer, V. Schmidt & B. Schröder (2004): How much suitable habitat is left for the last known population of the Pale-headed Brushfinch? Condor 106: 429-434. Oppel, S., H. M. Schaefer, V. Schmidt & B. Schröder (2004): Cowbird parasitism of the Pale-headed Brush-Finch Atlapetes pallidiceps: Implications for conservation and management. Bird Conservation International 14: 63-75. Krabbe, N. (2004): Pale-headed Brush-Finch Atlapetes pallidiceps (Birds: Emberizidae): notes on population size, habitat, vocalizations, feeding, interference competition, and conservation. Bird Conservation International 14: 77-86. 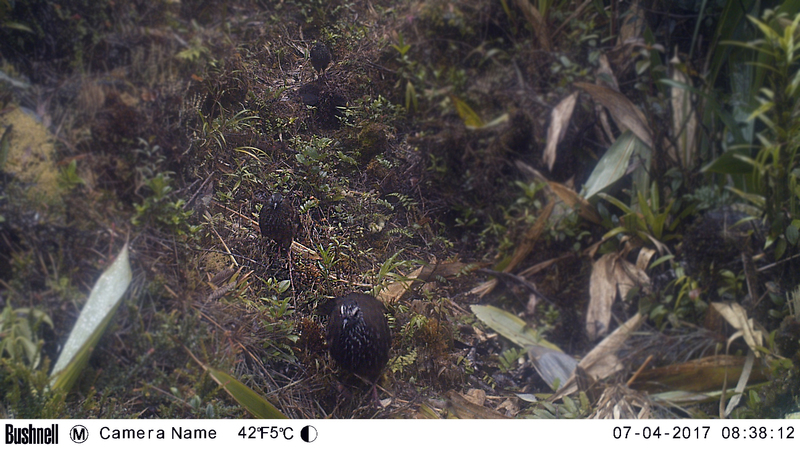 Oppel, S., H. M. Schaefer & V. Schmidt (2003): First description of the nest, eggs, and breeding behavior of the Pale-headed Brushfinch (Atlapetes pallidiceps) from Ecuador. Wilson Bulletin 115: 360-366.
not extinct. Cotinga 11: 50-54. 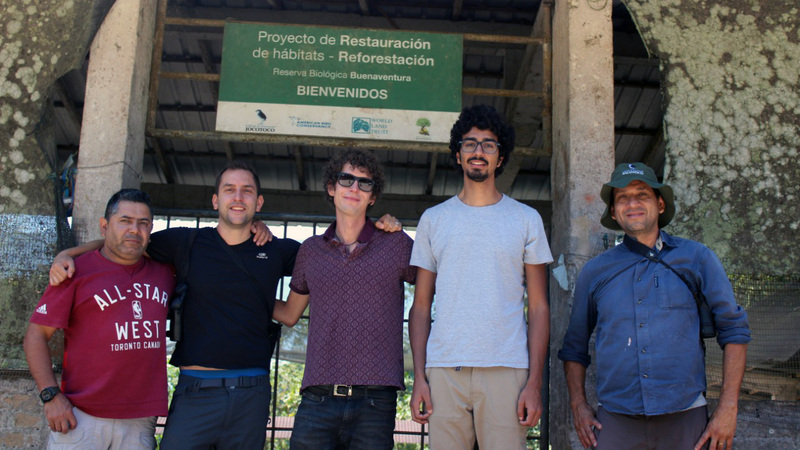 The Canandé Reserve was visited by two prestigious botanists: Dr. Bente Klitgaard (Royal Botanic Gardens of Kew) and Dr. Pablo Lozano (Jocotoco Foundation and researcher of the Amazonian University of Puyo). The Canandé reserve was visited by two prestigious botanists: Dr. Bente Klitgaard, of the Royal Botanic Garden of Kew, and Dr. Pablo Lozano, member of Fundación de Conservación Jocotoco and researcher of the Amazonian University of Puyo, who explored the reserve with the objective of carrying out a rapid assessment of the state of conservation of the forests in the area. One of the most important findings after their visit was the discovery of a previously unknown population of Ecuadendron acosta-solisianum D.A. Neill. This species is endemic to the Chocó area and locally known as "Guabo". Its wood is widely used in this area, which has led the species to its demise in other areas of Chocó. This recently discovered population may be one of the last remnants of the species in Ecuador, and may also represent a last chance to guarantee the survival of the species. 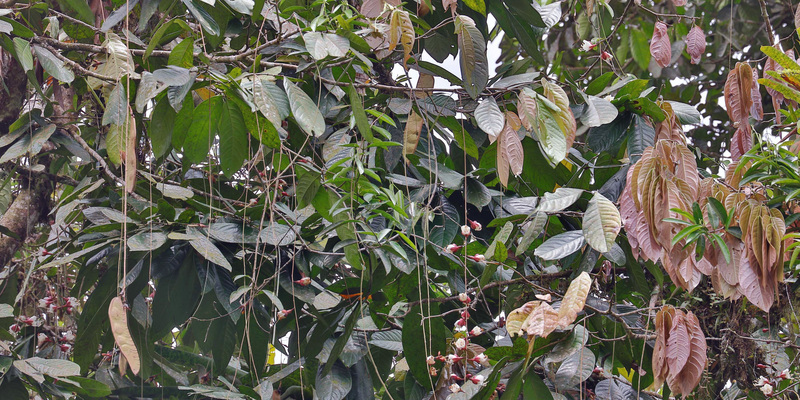 This Ecuadendron patch will serve as a study site for pollination issues, dispersal mechanisms, and germination and regeneration studies that will allow local environmental authorities to take measures to conserve this iconic species from Ecuador. Currently, Canandé reserve staff is collecting seeds of the species and constructing a nursery with the objective of producing seedlings and planting them in different areas of the reserve. The Great Green Macaw (Ara ambiguus) is an Endangered species, with a world population of less than 3,700 individuals. It extends from the south of Guatemala to the southwest of Ecuador. The Ecuadorian subspecies guayaquilensis is Critically Endangered, with less than 30 individuals in the wild. In Ecuador, the Great Green Macaw is found only in two known populations, in Esmeraldas and in the Chongòn-Colonche Mountain Range. 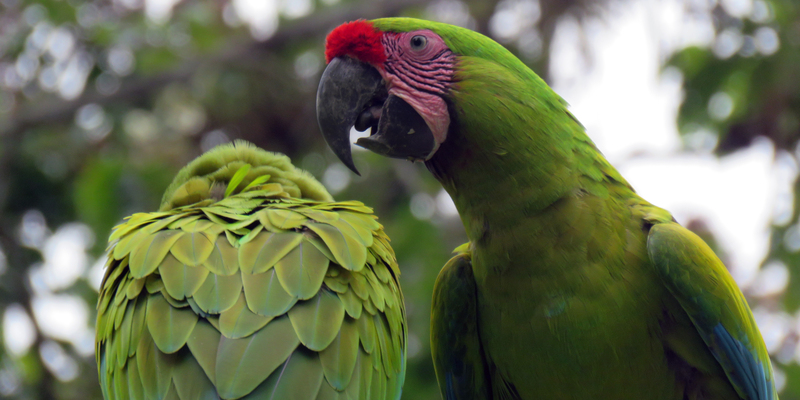 The causes of its disappearance were the deforestation, causing the loss of its habitat, and the illegal traffic of species, since the Macaws were sold as pets. Jocotoco Foundation works on the reintroduction and release of 10 macaws in the Ayampe Reserve (southwest of the Machalilla National Park, from where, it is believed that they disappeared 50 years ago), from the Jambelí Rescue Center, where the only program of reproduction in captivity of this species. Environmental education campaign that will be carried out before and after the liberation in all the neighboring communities. The present project is a long-term reintroduction plan. We transfered another group in 2018 after the current ones seems to have successful adaptated, and we will initiate a nest boxes project to stimulate reproductive success. The reforestation and restoration program that Fundación de Conservación Jocotoco opened in 2004 helps to conserve its reserve network. Jocotoco carries out a successful program of reforestation and restoration of degraded habitats within its reserve system. In some cases, when the foundation acquires areas of critical habitat for the expansion of land, the properties contain degraded areas, the result of human activities such as the exploitation of wood and the constant advance of the agricultural border. Jocotoco started its reforestation projects in 2004, which have focused mainly on the reserves of Tapichalaca, Buenaventura, Jorupe and Yanacocha. The foundation uses only local native species, and between 10 and 25 different species depending on the restored habitat. So far, Jocotoco Foundation has successfully planted more than 1,400,000 native trees of 130 species, restoring more than 3000 hectares of key habitat for countless birds and other species of flora and fauna, becoming a leading organization in ecosystem restoration in Ecuador. Jocotoco Foundation maintains excellent relations with the communities that live and work around its reserve system. These communities are keen to support the conservation work of the organization. As part of its institutional policies, Jocotoco provides employment opportunities to people from local communities. In the same way, Jocotoco works actively in awareness campaigns in the surrounding communities, aimed at adults, teens and children. It is worth mentioning that the organization was the pioneer in carrying out the awareness campaign to avoid the indiscriminate felling of Palma de Ramos and to avoid the loss of the Pericos home in 2004, which, in the beginning, focused on the provinces of the South of the country. At present, this campaign is carried out annually throughout the country and is managed by national authorities. 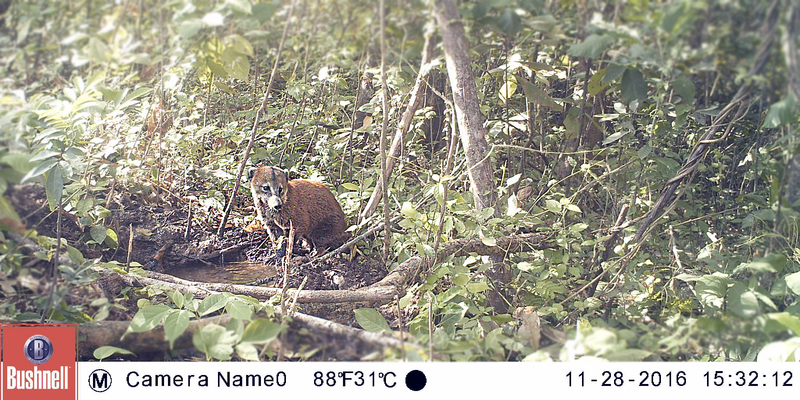 At the beginning of 2005, Jocotoco carried out a wildlife monitoring project using trap cameras in several of its reserves: Canandé, Yanacocha, Narupa, Antisanilla, Buenaventura, Tapichalaca and Jorupe. 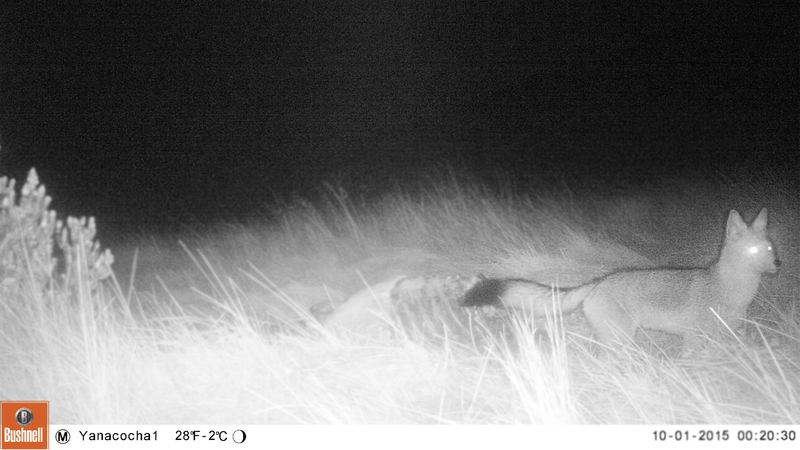 The cameras allow to study and record data of several species of animals non-invasively through photographs, especially mammals, which due to their shyness or nocturnal habits are rarely observed. The cameras have been placed in areas where mammal tracks have been recorded in the past or that have been identified as wildlife trails. The cameras are reviewed every two weeks and each of them includes important information such as date, place, time, phase of the moon and temperature. 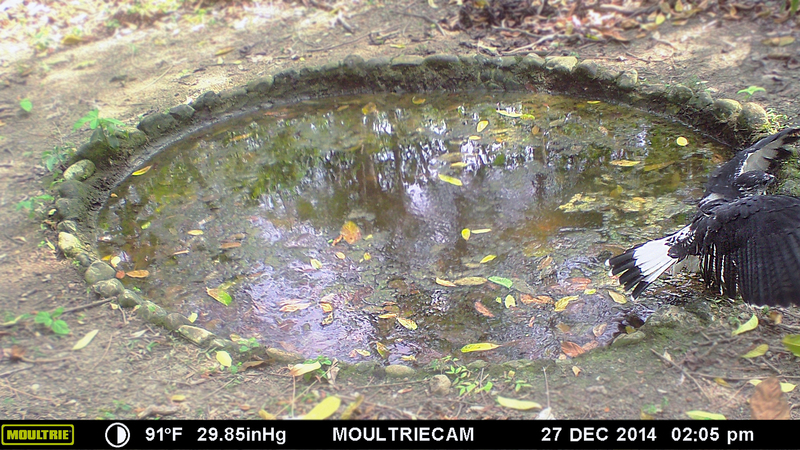 So far, the camera trap project has recorded the presence of several species of mammals such as: Spectacled Bears, Puma, Jaguarundi, Ocelot, Giant Otter, Anteater, Deer, Andean Tapir, Andean Fox, among others. In the same way, it has been possible to register species of rare birds such as black Tinamou. 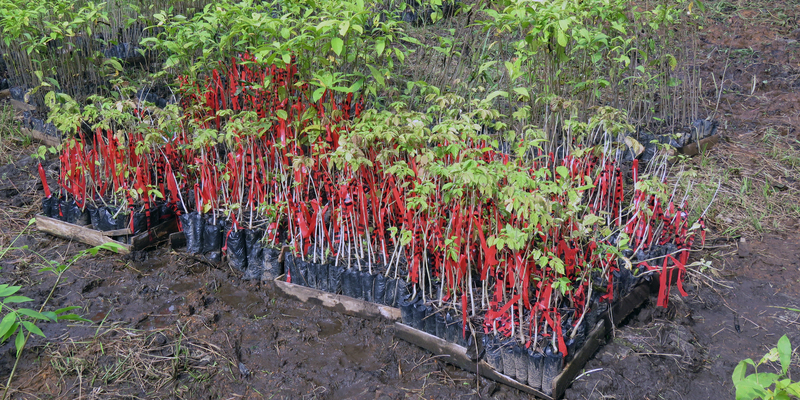 With an application and geo-reference system you can help the planet, Red Forestal and Jocotoco Foundation initiate a new pilot project for the conservation and reforestation of native trees. Red Forestal is a foundation that seeks the protection and conservation of Ecuador's ecosystems and biodiversity. With their work they try to fight the loss of forests and habitats in the country and encourage people through their Facebook page to be environmentally aware. Felipe Kohler says "our engine is to do something that has meaning and has a vision for the future, for generations to come, we would like to form a team that likes to innovate and care about the environment." For this reason, the Jocotoco Foundation and the Forest Network signed a cooperation agreement in which they commit themselves to carry out a pilot project with endemic trees in the Buenaventura Reserve, which starts this September. The objective of the project is that people can help the environment from the comfort of their home and anywhere in the world. This will be possible through the mobile application "Arbola" created by Red Forestal, is a social network where users can generate a profile and sponsor trees choosing their species (the application so far gives you to choose from 5 to 10 endemic species ), the area in which it will be planted and monitor its growth. René Rivas, reforestation director of Jocotoco, selected one hectare in the Buenaventura Reserve, which was delimited with the same georeferencing system through a submetric GPS. For now, the goal is to plant a thousand trees and all donors can see the growth of the selected species as it is happening in real time.